Yes, both Planika and aFire supply a quality product. However, they come at it from two different directions. Planika uses a more complicated system requiring two stages to transition the fuel into a gas. aFire uses a less complicated single step process. Both are great solutions and burn absolutely clean. aFire tends to be more economical process. Thanks aFire for noticing our products and studying our technology. Our so called "complicated" system is to unsure the highest safety standards for our users. Our brand has been awarded with numerous international safety certificates, and our intelligent fires are easy to use, operate, and install. fire pit - Where can I get one of those awesome fire boxes? ! Thank you! Ok thanks for getting back anyway!! We are building a house with 3 gas fireplaces, do you have any connections in Cincinnati or near by? Blue comforter cover - where is it from? Thanks! sorry. Don't know. We are manufacturer of ethanol burning fireplaces. Purple Wall - What color is the purple wall? Thanks. 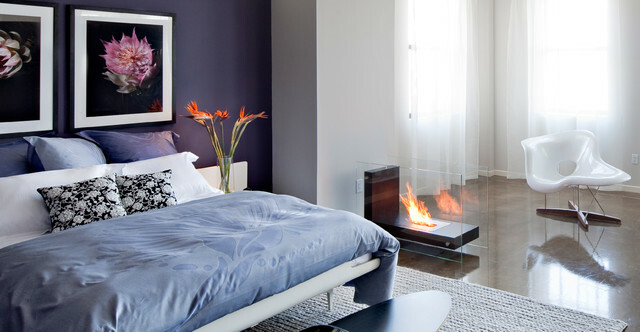 Bedroom colors - What is the name of the accent wall color and also the color of the wall next to it. Can you tell me what color the back wall is? The purple. Where can you buy the Euro sham covers? where are the prints from? Accent wall - I have an accent wall right behind my bed with the same ''plum'' color, I also have a window on that wall where I have to put a cutain but am not sure as to the color I should pick.. HELP! I still do not have any colors as far as my bedding but had in mind the peacock colors.